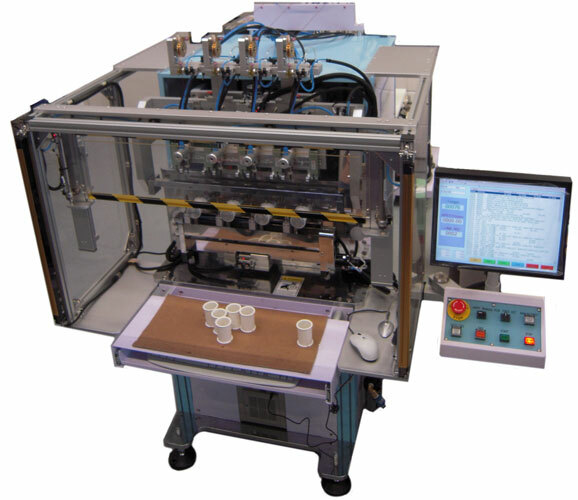 four spindle multi axis automatic coil winding machine - video demonstration 0.06 wire and 1.4mm wire on the same machine. IWM were proud to develop a solution together with our customer, who wanted to get away from taping at end if cycle. Their application left the end wire in middle of chamber, and required a fixing point to bend 90 to exit the bobbin..
We integrated a glue system, with dispenser and UV curing head mounted next each guide tube, with full positional programmability, and macros to purge individual glue heads.